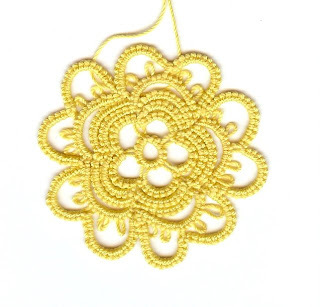 Despite all of the interruptions from my puppy, Sadie, I managed to complete this yellow rosette and send it to Georgia for a critique. I hope I have managed to get it right this time. I even made a picot gage to get the picots all the same size. I think it looks pretty good and hope to get a good critique. Then it will be off to my granddaughter to add to her hat. She will have three of them now all in different colors and each a little different look. Good job! I like the design of the last chain around!